Chris Foggin was born in Salisbury (now Harare), Zimbabwe, in 1947. After undertaking a first year BSc at Cape Town University in 1966, he was accepted into the Faculty of Veterinary Science at Onderstepoort, University of Pretoria, South Africa and completed his Bachelor of Veterinary Science degree there in 1970. After five years in private, mixed veterinary practice in Zimbabwe and the UK, he joined the Veterinary Research Laboratory (now the Central Veterinary Laboratory), in the Ministry of Agriculture in February 1976. He remained in the Government Veterinary Services from that date until his age-compulsory retirement in August 2012. 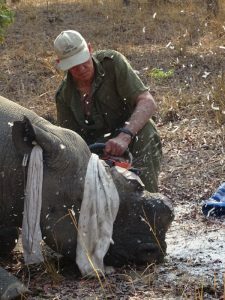 Chris joined the Victoria Falls Wildlife Trust following his retirement from Government service in 2012 and is active in wildlife disease diagnosis and investigation and some field and clinical wildlife veterinary work.